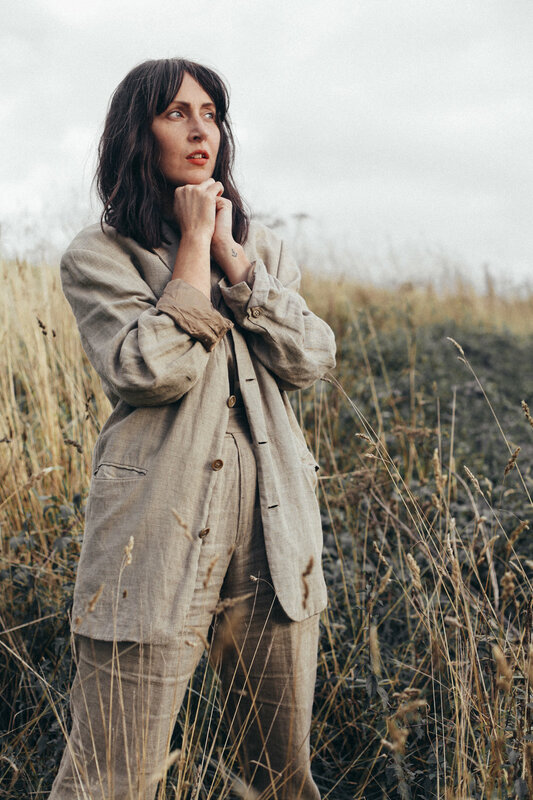 Catching the last light on a calm September evening, we floated through the grasses with muse Emily Dymond; yoga teacher and founder of clothing brand Emily and Khadi. She spoke with us about the joy and challenges found in creating a new business and the endless benefits of submerging yourself into nature to reground and rejuvenate. I think I have a pretty balanced skin type, it can get a little dry in the colder months but I’ve not really experienced any changes over the years. I’ve been lucky in that respect. Do you have a creative discipline or passion which you dedicate your time to? How does it impact your health/wellbeing? I would say I approach my whole life as a creative discipline but it’s taken me a long time to get to a point where I can channel my creative energy effectively & be happy with the outcome. For years I felt an enormous frustration as I couldn’t seem to express myself in a way that I felt comfortable with. There was a huge contrast between what I felt inside and the life I was living. I’m really only just reaching a place at 33 where I can say I truly understand who I really am and I’m comfortable in my own skin. You have to dig deep to get to know yourself and then things start to flow. I used to practice Yoga really intensely (2.5 hours a day) for several years and that helped me to get rid of a lot of unnecessary things I was holding within myself, when there’s nothing getting in the way you can see so much clearer. I now practice much less regularly and for a shorter length of time. I use my new found time & energy to focus on other things. That intense period of Yoga immersion was a great tool for healing and transformation, but you have to realise when the work is done & it’s now just a case of maintenance and enjoying the space I'd created. You don’t keeping building a house, at some point you enjoy living in it. I feel like I’ve lived a million lives sometimes, as there have been so many stages and phases that have got me to where I am now. I think one of our duties as human beings is to create the best version of ourselves as possible - for ourselves and the greater good. That can involve blood sweat and tears at times and it can be extremely challenging and uncomfortable when you’re in a transitional phase. Existence is, by its very nature a creative process and I think we have to find our own personal way of living in harmony with that. Some of the most challenging and creative projects for me have been internal ones where I’ve had to transform and metamorphosise uncomfortable or painful feelings & beliefs about myself. Two years ago I left full time employment and headed to India with no knowing of the direction my life would take but a strong intuitive feeling I had to go. I ended up living there for a year and a few months into my stay I unexpectedly came across a beautiful fabric called Khadi that’s hand-spun, handwoven and naturally dyed (not all Khadi is naturally dyed but it is from the place I source it). I started designing pieces and then had the range made by a tailor, it grew from there. I’m really happy with the way Emily & Khadi is going & I think that is everything I’ve been working towards – just to simply feel proud of my work and that it expresses a part of my true nature. I know there is a lot more to come and I feel in a stronger place than ever to go forward. When I’m free of any mental niggles and I feel excited about life and it’s possibilities. When I can laugh freely. My daily self-care rituals are simple things, a good nights sleep, plenty to drink (mostly tea) & being out in nature at least once a day. If I can have those three basic elements I’ll be in the best possible headspace. Beauty is definitely something that radiates; it’s the je ne sais quoi an indefinable bitter sweetness. It is a poetic notion that’s open for interpretation and everyone will see beauty in different ways but I definitely think it is felt in the heart when we see it. Nature is always my first port of call when I’m feeling out of sorts, it connects you with something that’s beyond and bigger than yourself which then brings you back to yourself renewed and reconnected. All the answers lie in nature. Also music as it has the power to take you out of yourself and put you in a different flow of feeling. Swimming in the sea (during the summer, I’m not brave enough in winter months) has become a very soulful experience for me as I approach it as a mental and physical cleansing, water is a really important element for my well being as I’m quite earthy by nature (being a Taurean) so it helps to balance. I lived in London for nearly a decade after graduating (I was born there so felt a calling) from university and I now cherish the benefits of living by the sea far more than I would have done before. Water has such a calming and soothing effect, even the simple act of splashing your face with cold water can completely clear your mind and give you clarity. I definitely enjoy being a woman and relish in all that is feminine and the strength of our resolve. But as women we have to be very aware of ourselves as our emotional and physical energies can fluctuate so rapidly depending on various factors. The cycle of the moon, for example, can really determine how I feel, I’m always fully charged around the full moon and my emotions are heightened, around a new moon is a great time for introspection and taking things gently. If we are aware of these influences we can work with them positively. I think ultimately, I embrace womanhood by valuing it. Yes – my all time favourite quote from my all time favourite song by Dinah Washington, “This bitter Earth’. There are so many fantastic lyrics in that song but this one tops them all. When I heard that line for the first time it hit me so hard – sometimes I’ve felt like I’m living on the edge, whether that be of my emotions or my life but that line speaks to me to say it’s better to live honestly, however challenging that can be at times, it’s better to be true and try - to allow the Rose to glow. Emily uses our Renewing everyday face oil which helps to rejuvenate & deeply nourish her skin. You can find out more about her beautiful clothing range Emily and Khadi here.